My main challenge in Ixmiquilpan was putting the syllables in the correct order: I kept wanting to call it Shh-qui-MIL-pan. Not that it really mattered; there was no one to hear me misspeak except Mike, who couldn’t pronounce it either. In case you want to practice, it’s Shh-mee-KEEL-pan. How about using this mnemonic: “Shh me kill pan!” … accompanied by an image a frying-pan-wielding road runner racing toward a trembling Wiley E. Coyote. I think I’ve got it now. And with the help of the memory trick provided above, you too may be geared up to visit this old-fashioned yet seemingly prosperous town just a few hours north of Mexico City. More or less in the center of Hidalgo state, west of the mountains and at the tail end of the hot and semi-arid Mezquital Valley, Ixmiquilpan is known for its hot springs and water parks. Located near the seismically active volcanic zone called the Trans-Mexican Volcanic Belt (el Eje Volcánico Transversal), Ixmiquilpan is surrounded by water parks and hot springs. There are more than you can count on both hands, and these are not rinky dink affairs. Competing for customers, these modern aquatic parks are moderately priced and offer giant slalom slides, “lazy rivers,” wave pools, and king-size and kiddie pools, along with soccer fields and b-ball courts, picnicking areas, restaurants, and overnight lodgings. The water in their spring-fed pools averages 38C (100F). See the Travel Guide below for more details. A bit farther afield and down a steep, graded dirt road, Tolantongo is an amazing place to spend the day … or several days. Waterfalls crash inside caves and arch over stony hillsides covered in cacti, huizache, and acacias. Zipping over half-submerged rocks, the Carrizal River creates natural hydro baths and quiet pools surrounded by swimming pools and camping areas and cabins and restaurants. Ixmiquilpan itself has a prosperous, self-reliant, century-old feel. On the south side of the main square, the church was built in the 16th century, but many of the downtown buildings are early 20th century, including the pink brick City Hall, directly across Plaza Juárez. Fronting the remaining two sides of the plaza are two-story buildings faced with deep, arched porticos. Protected from the sun and rain, shoe-shine men carry out a brisk business; there are ice cream parlors and cafes and small shops. Like many other towns we visited in Hidalgo, Ixmiquilpan has a grand old church and adjoining monastery. El Ex-Convento de San Miguel Arcángel was built by the Augustinians. What sets this former mission apart from the others are its astonishing murals. Amid the Christian symbols and saints stalk warriors clad in jaguar skins, and other pre-Hispanic icons. Painted by indigenous artisans, these figures include centaurs, dragons, and other strange creatures. These priceless murals were hidden under layers of paint for perhaps hundreds of years, and restored in the mid-20th century. This church dedicated to the Archangel Michael was designed by the architect-priest Fray Andrés de Mata de Barrios, who also designed the church at Actopan. Both have murals with pre-Hispanic icons, although Ixmiquilpan has more. A few blocks behind el Ex-Convento de San Miguel Arcángel is another lovely temple, la Capilla de Nuestra Señora del Carmen. This 18th-century church has an exquisite churrigueresque façade between matching bell towers, and inside, a multitude of carved and gilded altars and unique paintings. Just a few blocks away from the main plaza is the bustling town market, where we browsed for a machete, clothing, cookware of the sort that’s been in vogue for a couple of centuries (blue-speckled, enamel-covered tin, and earthenware pots probably dipped in lead-bearing glaze), and fresh fruits and vegetables. The market restaurant stalls were doing a brisk business at about 4PM. Following the advice of the efficient girl in the downtown tourism kiosk, Mike and I headed for La Herradura restaurant, just a few blocks behind City Hall. Both it and El Cactus, which she also recommended, served delicious regional and Mexican food, and were cheap cheap cheap by our standards. Later we hit the Santa Clara café (a Mexican chain known for its rich ice cream) for yummy coffee drinks and, a few storefronts down, La Michoacana for strawberry and guava ice cream. We enjoyed our two nights in Ixmiquilpan. We spent most of one day at Tolantongo, and if we’d had more time, would have spent another at one of the big water parks outside town. On our next trip we’ll check out a few: probably midweek and avoiding major school vacations. Although we’re not spelunkers, we might also check out las Grutas de Xoxafi (www.grutasxoxafi.com.mx). This series of caves and caverns is open to casual explorers as well as serious rock climbers for a modest fee. It’s about halfway between Ixmiquilpan and Actopan, near the town of Santiago de Anaya. And FYI, it’s pronounced su-SHA-fi. Hotel Casa Blanca ($$, Av. Insurgentes 149, tels. 759/723-8230 and 723-8231, www.hotelcasablancaixmiquilpan.com) is a simple but clean hotel on the highway, a few stoplights before the entrance to downtown. There’s a small swimming pool, and some rooms have excellent Jacuzzi tubs for only a few dollars more than the standard rooms. There’s no restaurant, but onsite parking, cable TV with a few English channels, and free Wi-Fi. El Cactus ($$, Calle Leandro Valle 13, tel. 759/728-8316) is popular with visitors and local families. Waiters are friendly and professional. Try the delicious molcajete: strips of skirt steak in a super yummy red sauce surrounded by grilled onion and a hot jalapeno pepper, and avocado topped with melting cheese. Served in a stone molcajete (hence the name) with a basket of warm tortillas. El Herradero ($$--$$$, Av. Benito Juárez 12, tel. 759/723-8977) is recommended for its surprisingly tender arrachera (skirt steak). There’s an extensive menu of simply prepared meats, chicken, and seafood. Among the appetizers are shrimp cocktail and the pre-Hispanic delicacy escamole (ant larvae), which definitely tastes better than it sounds. It’s open daily for breakfast, lunch, and dinner. Right on the main plaza, visit Santa Clara for a variety of coffee drinks as well as excellent ice cream served in a cone, dish, or in a more elaborate sundae. Just a few doors up, La Michoacana is a less expensive option for ice cream cones, paletas (milk- or water-based frozen fruit on a stick), and cold drinks, but no coffee. Ixmiquilpan has more than a dozen water parks; it’s a kids’ paradise. If you read Spanish, http://balneariosdehidalgo.com has a list of hot springs and aquatic parks throughout the state with links to the individual sites. Among the best known and largest of Ixmiquilpan’s thermal-spring aquatic fun centers is EcoAlberto (759/727-7016, www.ecoalberto.com.mx), with camping, cabins, restaurant and snack stands, kayaking and boating, canopy rides, and more in addition to the water park. Dios Padre (Carr. Mexico-Laredo Km 156, Tel. 759/723-2548, www.padiospadre.com.mx) offers an Olympic-size swimming pool, children’s’ and wading pools, restaurant, and camping area. Te-Pathé (Carr. México-Laredo Km. 152.5, tel. 759/727-7585 and 727-7586, 011800/823-0523 toll-free in Mexico, www.tepatheacuatico.com.mx) has a wave pool and a lazy river pool, where you can drift with the current, in addition to other swimming pools, one with giant water slides. There’s a picnic area, soccer field, a restaurant and grocery store, and an area for overnight camping. There are plenty more to choose from, many of them on the Mexico-Laredo Highway leading into town. If you crave a more natural setting, visit Las Grutas de Tolantongo. Ixmiquilpan is 164 km (102 miles) from Mexico City; 76 km (47 miles) from Pachuca; 64 km (40 miles) from Tula; and 149 km (92 miles) from Querétaro. For specific driving directions, go to http://www.mexicoguru.com/mexico-driving-distance.php. 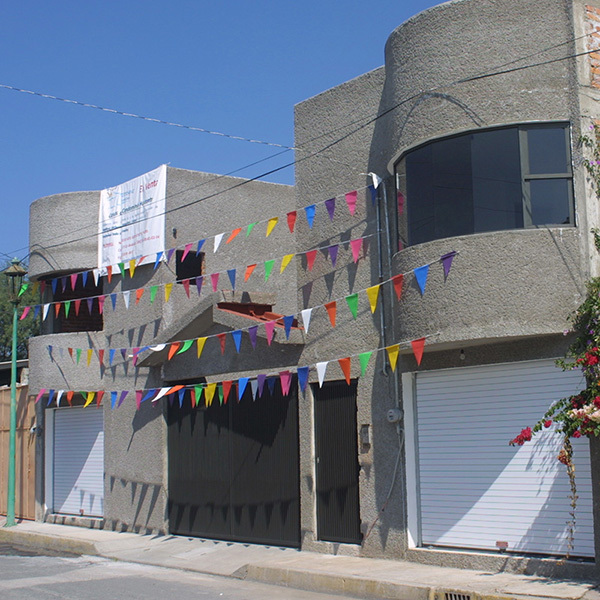 Get a bus at Pachuca’s Central Camionero (Bus Station; Blvd. Rojo Gómez s/n, tel. 771/713-3449). Taxis are found on and around Ixmiquilpan’s main plaza. For more information about Ixmiquilpan, visit the tourist kiosk on the sidewalk in front of San Miguel Archangel church, facing the main plaza, or go to the Presidencia Municipal (City Hall, tels. 759/723-0376 or 759/723-0193), on the opposite side of the square.